Okay so I have been putting off telling this story because it is soooooooooooo gross and icky, but I promised and now that my show is over…….. well here it is. The actor who played Tristan, (our fair Knight) was in the greenroom the other day when Jamie and Nicole called him out to tell me a story. Now I knew the subject beforehand, but they say THEY didn’t know and it tells SOOOO much better…so here goes. A 3rd grade David wakes up to a blinding pain one morning. He says he thinks his head is exploding. He can’t even open his eyes. But he has to go to school so he showers and has breakfast…. then he goes into his room and sits down on his bed. The pain is awful. He is almost crying. And there is a skinny black leg in his hand. He throws it down and grabs a tissue; blows out another leg. Piece by piece the cockroach comes out and the pressure in his head subsides. The American Cockroach – a.k.a. 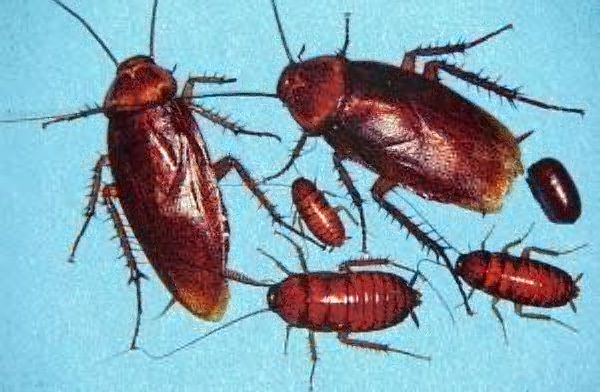 Palmetto Bug is larger than your average cockroach AND it can fly! Yes, Really!!!!!! BLEAH – – that is gross! David says he likes to keep his head buried in a pillow while he sleeps nowadays. Okay, I wrote it. It’s not a good post, its gross!!! !